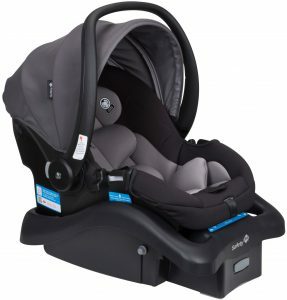 You should take a look at Safety 1st OnBoard 35 Air and OnBoard 35 LT as two choices that you should consider if you are looking for infant car seat and consider Safety 1st as your brand. As two almost similar models, it’s quite confusing to decide between Safety 1st OnBoard 35 Air and OnBoard 35 LT. Which of them is the one that you should choose? To answer that question, we need to know the differences between those two infant car seat models. Let’s talk about that in this article. Let’s take a look at the table of comparison below to see the key specs and features of Safety 1st OnBoard 35 Air and Safety 1st OnBoard 35 LT. We need to know the specs and features of those two infant car seat before we can talk more about their difference. There are few different specs and features between Safety 1st OnBoard 35 Air and Safety 1st OnBoard 35 LT as we can find from the table above. Let’s talk more about those differences together. The first difference between Safety 1st OnBoard 35 Air and Safety 1st OnBoard 35 LT is the Air Protect Side Impact Protection that we can find in Safety 1st OnBoard 35 Air. Although we can find that Safety 1st OnBoard 35 LT is already completed with Side Impact Protection, but Air Protect Side Impact Protection is able to protect your child better in any case of side impact collision. 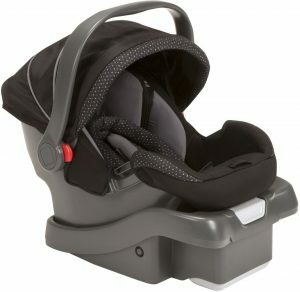 Safety 1st OnBoard 35 LT is one of the lightest infant car seat that we can find in the market for baby up to 35 lbs. The weight of the Safety 1st OnBoard 35 LT carrier is only 7.9 lbs, while the carrier weight of Safety 1st OnBoard 35 Air is 9 lbs. We can find that both of Safety 1st OnBoard 35 Air and Safety 1st OnBoard 35 LT comes with adjustable base position. But the number of adjustable position of those two infant car seats are different. Safety 1st OnBoard 35 Air comes with 5 adjustable base position, while Safety 1st OnBoard 35 LT comes with only 2 positions. With only 2 position, the adjustable base position of Safety 1st OnBoard 35 LT is quite limited. Safety 1st OnBoard 35 Air can be said as the model that positioned higher than Safety 1st OnBoard 35 LT. So we can find that Safety 1st OnBoard 35 Air is usually offered at the higher price than Safety 1st OnBoard 35 LT. Since the price of infant car seats are changing from time to time, it’s recommended that we check their latest price to know their updated price difference. Share the post "Safety 1st OnBoard 35 Air vs OnBoard 35 LT Review"
Safety 1st Guide 65 Sport and Safety 1st Guide 65 (regular)..